In spite of this earth-shattering information, my husband, G, has threatened to become a vegan if I try to serve him chicken livers. Now THAT’S quite a threat! 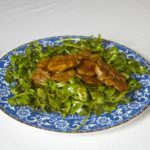 But if he were to allow himself to try this recipe for Chicken Liver Salad with Raspberry Vinaigrette he would find there’s no need to go to the dark side. The inspiration came from my recent perusal of a Nigella Lawson cookbook. G seemed very interested in said cookbook but I dare say it was Nigella he fancied and not the chicken livers. 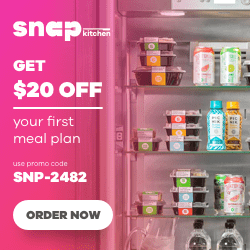 Nigella’s recipe calls for maple syrup and sherry vinegar but she references a time when raspberry vinegar was all the rage for similar salade tiède on restaurant menus. Since I had some raspberry balsamic vinegar on hand I decided to give it a try and it turned out delicious. 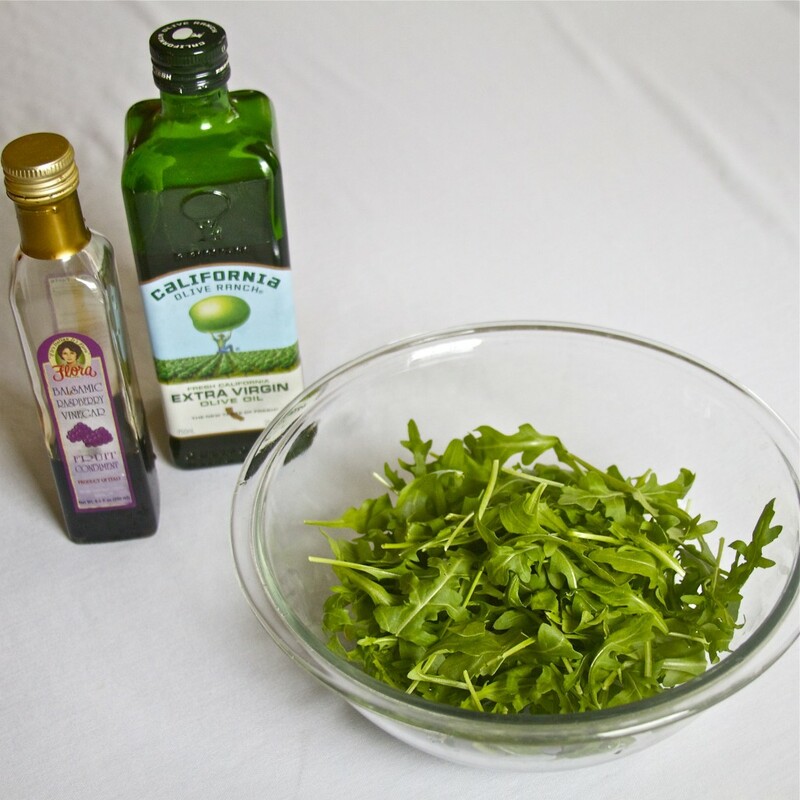 Place the arugula into a bowl that you will use for tossing it with the dressing. 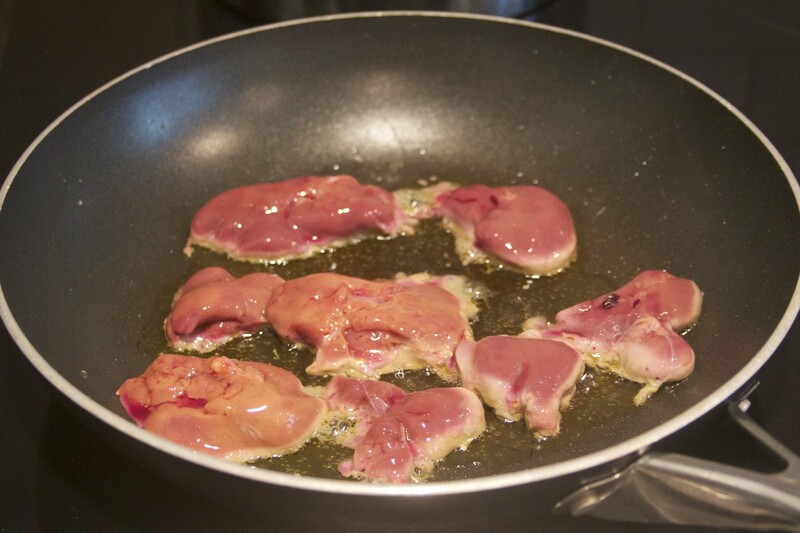 Heat the oil in a skillet and cook the livers for about 8 minutes, turning them and squishing them so they cook evenly. Once the livers are done, take the pan off the heat and add the vinegar to the pan to deglaze it and mix with the oil. Pour the liquid from the pan onto the salad greens, add salt and pepper to taste and toss. 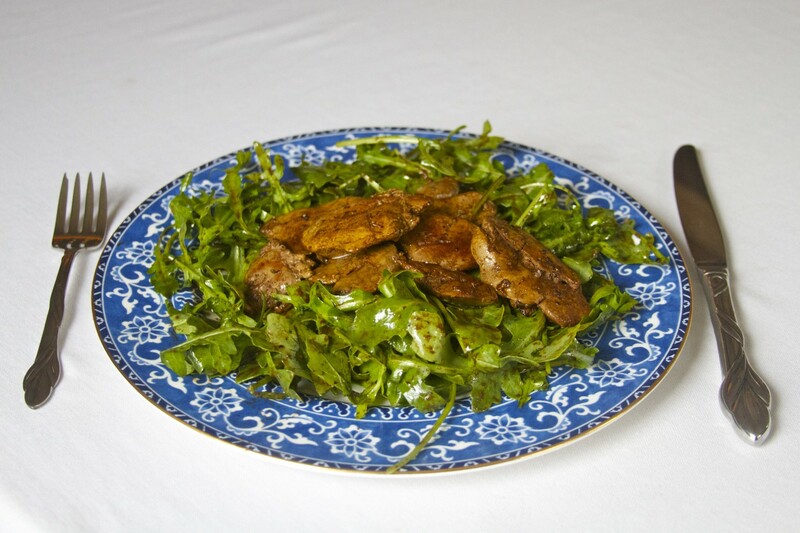 Divide the greens between two plates, place 1/2 the chicken livers on top of each salad and serve warm. The preparation was easy and quick. I made it for myself for lunch and it was ready in no time. The raspberry vinaigrette went REALLY well with the liver and the bite and slight bitterness of the arugula counter-balanced the sweetness perfectly. I think even G might be impressed. We shall see…. *Because the liver is an organ that filters out bad stuff, eating organic chicken livers would be ideal to minimize any toxins that might build up in the livers of conventionally produced chickens. 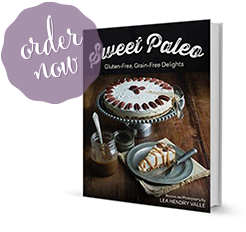 5 Responses to "Chicken Liver Salad with Raspberry Vinaigrette"
Hey I’m a young kid and I made this fun quiz to test your Paleo devotion. I read your blog all the time and I was thinking your readers might enjoy it! My favorite way to eat chicken livers is to lightly batter them in almond flour, fry them, then just before they are finished cooking, add scrambled eggs. Doesn’t look like much but it tastes great. I would not have thought to put livers and eggs together. But I could see that working and it would be very nutritious as well!